Although Michael Jordan’s “Republicans buy sneakers too” (a statement he might not have actually said) is oft-cited as a juxtaposition to the very public activism from many contemporary athletes, he was definitely not the only star of the ‘90s finding oxygen and endorsements behind the both sides shield. Where a person like former Chicago Bulls guard Craig Hodges and his outspoken criticism of President Bush would’ve likely found much more support from his peers today, in the early ‘90s he was an outcast. It was just more socially acceptable then— and sometimes even encouraged — for black athletes to offer tepid and flaccid statements about politically and racially charged topics. But the zeitgeist has shifted. Perhaps not with the sports leagues themselves, as Colin Kaepernick’s continued unemployment clearly exhibits. But it’s actually become more controversial socially for athletes to toe America’s company line. And today, with the torrent of hate and bias and bigotry and lies streaming from The White House, politically neutral sounds and feels neutered. You’ve probably seen the image, striking and unforgettable: A black man, staring ahead in silent terror, with tears streaming down his face. First it was Daniel Kaluuya, who immortalized the image in Jordan Peele’s Academy Award-winning horror satire Get Out. Then it was Kanye West, who became the subject of several memes related to the movie — and fought back against them. Now it’s Prescott, in a mural that appeared this week in the Fabrication Yard in Trinity Groves, courtesy of artist Trey Wilder. 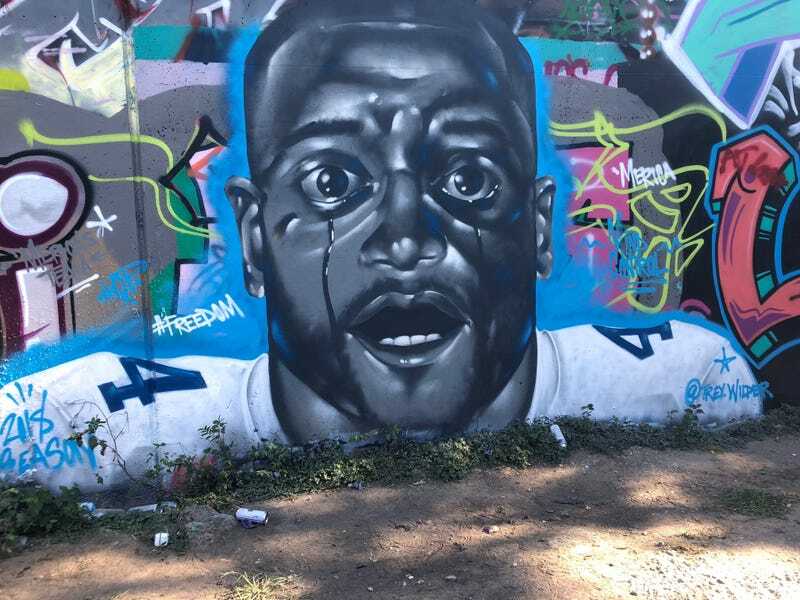 Wilder, 29, painted the image last week after he heard that Prescott had been named the “Donkey of the Week” on the nationally syndicated radio program The Breakfast Club. When asked why he chose to put Prescott in the Sunken Place, Wilder’s comments were telling. “I was just thinking about some of the scenes in the movie where the guy was hypnotized, and that’s what I believed [Prescott’s] remarks seemed like,” Wilder said. Perhaps it’s unfair that black athletes are expected to be progressive — or, at the very least, supportive of social justice issues — while their white teammates can stay mostly silent without anyone batting an eye. But while the pressure to speak up about injustice should definitely be applied to white athletes too, there’s really no excuse for black athletes to be company men when said company cares more about appeasing the racist president than making the country safer for them. Republicans just don’t buy that many sneakers.